Here’s a straightforward explanation of the circumstances in which FrogSparks may collect data pertaining to you, and how you can opt out of such collection. The Plain English version is merely an explanation, please refer the the second section for the legal version. When you purchase anything from the Play Store, Google provides the seller minimal personal information about the buyer, such as name, email address and mailing address​ country and postal code (changed early July 2013). No payment information (credit card number) is ever provided to the seller (FrogSparks). Opting out: the only way to avoid such data collection is to use an alternate payment method (but most payment methods require some amount of personal information sharing). When you purchase anything from PayPal, it provides the seller some personal information about the buyer, such as name, email address and​ country. No payment information (credit card number) is ever provided to the seller (FrogSparks). Opting out: the only way to avoid such data collection is to use Play Store purchases, which provide the seller less information. Opting out: you can prevent error reports from being sent by checking the Disable error reports preferences in MyTrails > Preferences > About. 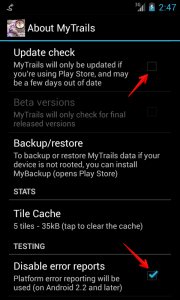 When MyTrails is launched, it attemps to connect to FrogSparks servers to determine if there is a new version. As it is doing so, it also sends some statistical information to allow us to better understand how our users collectively use MyTrails. Data being sent includes things like the number of times you’ve run MyTrails, the first and last date it was run, how many tracks you have, etc. It also includes MyTrails’ preferences, but all personal information is filtered out (names, addresses and passwords). If you specifically provided it in the preferences, your email address is also included. 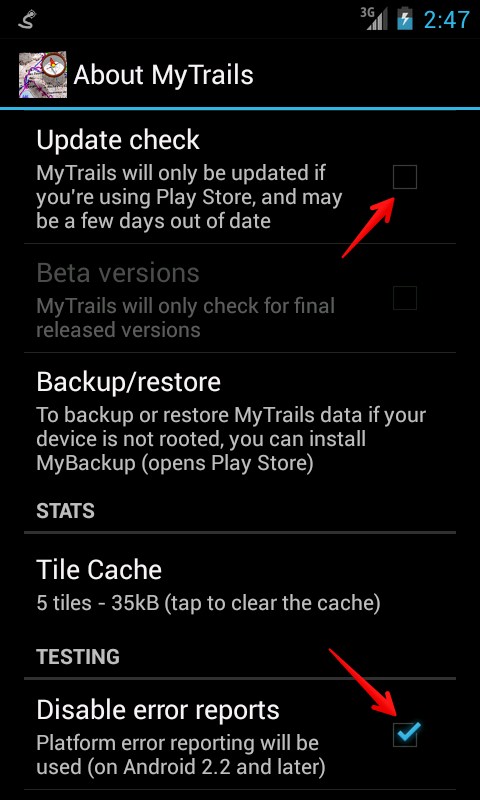 Opting out: you can prevent version checking from taking place by unchecking the Update check preferences in MyTrails > Preferences > About. When you create an (optional) FrogSparks account to share your map subscriptions among your devices, we store your name, email address and your (salted and Bcrypted) password. If you connect (optionally) with your Google account to share your map subscriptions among your devices, we store your name, email address and your Google ID number (no password). By using this Site and any of FrogSparks mobile applications, you signify your acceptance of this policy. If you do not agree to this policy, please do not use our Site or applications. Your continued use of the Site or applications following the posting of changes to this policy will be deemed your acceptance of those changes. This entry was posted in and tagged about1 on 18 April 2013 by frogsparks. Please also check the FAQ before posting. In particular, regarding subscription issues, please make sure that MyTrails is connected to your Google or FrogSparks accounts before contacting us. If you are unable or unwilling to use these communities or for questions about payment or your subscriptions, you can also email us directly at: support@frogsparks.com. We strive to answer any message quickly during our workday of approximately 9am-6pm Central European time. This entry was posted in and tagged about1 on 17 April 2012 by frogsparks. This entry was posted in and tagged about1 on 12 April 2012 by frogsparks.